In conjunction with Victoria's Code 9 Foundation, the Victorian chapter of Paramedics Australasia is pleased to welcome Dan Sundahl to Australia, and announce a special guest presentation on Mental Health Awareness. Daniel Sundahl (DanSun) is a published artist and writer and has two art books produced of his works. Articles of his work are featured in Canadian Paramedicine, Journal of Emergency Medicine (JEMS), Fire Rescue Magazine, EMS One, EMS World Magazine and The Canadian Journal of Emergency Nursing. 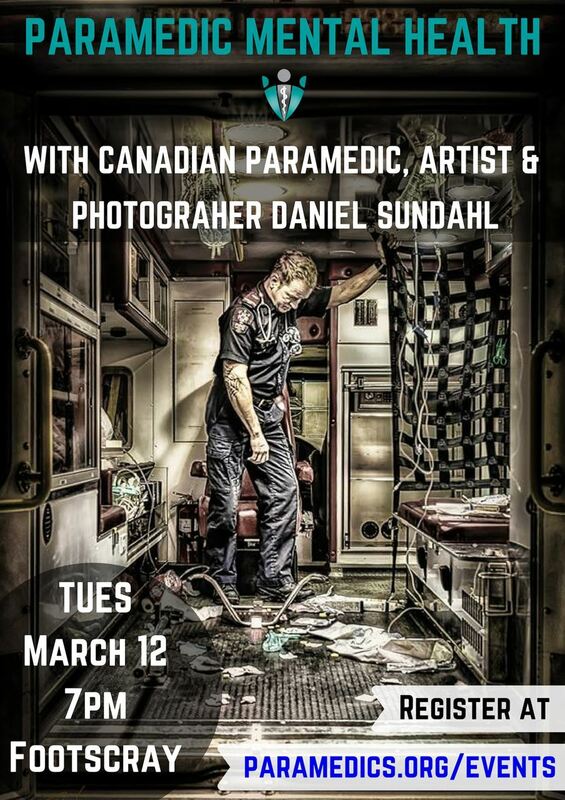 He is an advanced care paramedic, firefighter, pre-hospital educator, photographer and photo editor. His art is recognized worldwide, and he travels internationally speaking on his art and personal experiences with occupational stress injuries and post-traumatic growth.